While the first day of classes is just around the corner, there’s another event creeping up on the calendar catching the attention of students, faculty and staff. On Monday afternoon, Aug. 21, Belmont will host a campus-wide educational event to celebrate a once-in-a-lifetime total solar eclipse that’s making headlines across the nation. A total solar eclipse–when the moon passes in front of the sun in such a way as to completely block light to the earth–doesn’t occur every day. In fact, the last time Nashville was in what’s referenced as the “path of totality” of a solar eclipse was July 29, 1478. Yep, you read that right. The last time a total solar eclipse was visible in middle Tennessee was 14 years before Columbus landed in America. However, for nearly two minutes on Aug. 21–from 1:27-1:29 p.m.–Nashville will go completely dark as the path of the eclipse cuts across the state. As the largest metropolitan area in the path of totality, Music City is anticipating significant upticks in visitors as locations across the region host viewing parties and events. 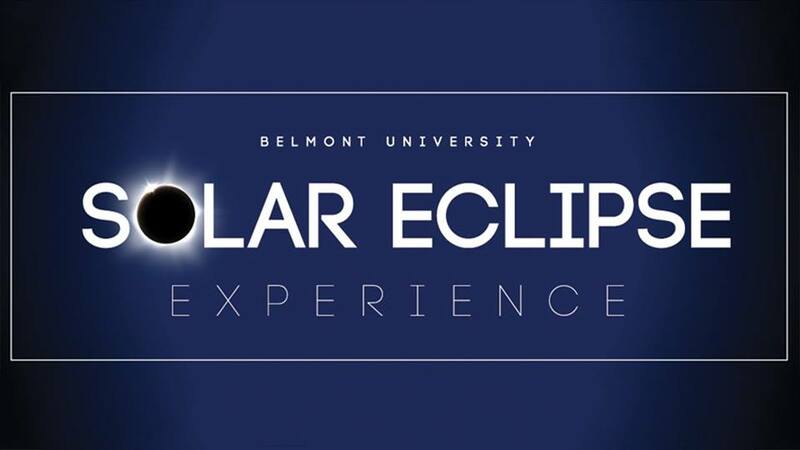 Belmont will join the fun by providing Solar Eclipse viewing glasses for everyone on campus along with special music and guest speakers on the Lawn in the hour prior to the event. Approximately 300 high school students will also be on campus to learn more about the eclipse from Belmont faculty. But viewing the eclipse in all its beauty also requires taking the proper precautions. As noted on the VisitMusicCity.com Eclipse site, “Before you look at anything, make sure you have approved solar glasses or solar shades handy. During the partial phases, it is NOT SAFE to look at the Sun with anything other than these. Sunglasses aren’t enough – nothing but approved solar glasses will work.” Belmont has ordered 10,000 solar shades that will be handed out for free to students, faculty, staff and guests for the August 21 viewing on The Lawn. The VisitMusicCity site also notes that special filters need to be used on any cameras attempting to capture photos of the eclipse as it is also dangerous to view the eclipse through a camera lens alone. And the next solar eclipse? While partial eclipses are more common and several states will get a view of a total solar eclipse in 2024, Nashville won’t be in the “path of totality” again until 2566. One more reason to save the date now for August 21 on the Lawn.